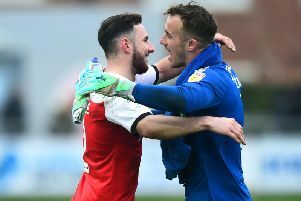 Ash Eastham insisted Fleetwood Town are not a dirty side as they await the outcome of their appeal against Lewie Coyle’s red card at Rochdale. Defender Coyle was sent off in the 54th minute of Saturday’s 1-1 draw at Spotland for a challenge on Joseph Rafferty. Town led at the time through Paddy Madden’s 16th goal of the season but Dale’s Ian Henderson equalised and 10-man Town had to settle for a draw. Town head coach Joey Barton confirmed the club would appeal and they hope to have the Leeds United loanee available for tomorrow’s trip to AFC Wimbledon. After that seventh red card of the campaign Town are bottom of the League One Fair Play table, though defender Eastham says that gives a false impression of Barton’s team. He said: “I think it is easy for people to say (that we are dirty). People look at our manager, think he was a full -blooded player and think he is telling our players to go in hard and be dirty, but that is not what we are. “We try to play fair but being physical with the opposition gives you an edge. “That can sometimes go against you and the red card on Saturday shows that, but we are not going to change the way we are. Eastham said he was baffled by the red card and echoed Barton’s view that referee Geoff Elringham was swayed by an assistant referee. “I was baffled by the sending off, I really was. “The referee did not give a free-kick (against Coyle) at the time, even though he was stood three or four yards away. “I thought it was a great tackle and apparently it has come from either the linesman or the fourth official to send him off. “That baffled me, when the referee is in such a better position to see the play. “It is something we had to deal with and they got back into the game, but I think we did well to hold on because it was backs against the wall with 10 men. And Eastham revealed what Coyle thought of the decision. He said: “According to Lewie, the referee said it was the linesman who gave it because of his follow-through in the tackle. “To me it looked like a superbly-timed tackle. Lewie said he thought he had caught him on the way through, which surprised us all. “The referee did not even see it that way because he did not even blow for a free-kick. “That is what baffled us but we move on now.